A High Quality Medical Clinic- At No Cost. Our medical clinic is free of charge for eligible patients. As a primary care office, we treat patients with chronic diseases: diabetes, hypertension, coronary disease, and depression. Our clinic provides orthopedics, dermatology, gynecology, health classes and a weekly psychiatry clinic. As necessary, we refer our patients for free treatment at one of 19 off-site subspecialty offices. Diagnostics. Roper St. Francis provides our patients with free labs, tests, and imaging services upon referral. Case Management. We provide primary care by 36 volunteer doctors and 25 nurses. Our Nurse Based Case Management is critical to the implementation of our services. 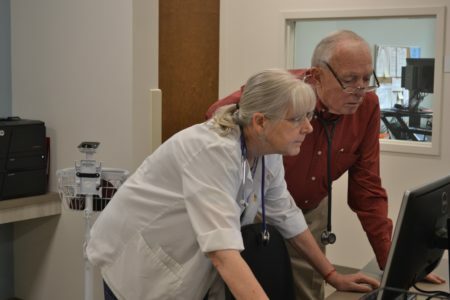 This service helps our patient to make the most of our on site primary medical care. Our patients find support through an on-going relationship with our Nurse Case Manager. They are educated on their specific medical needs, and assisted with managing chronic illnesses. Patients are assured regular appointments, lab work, X-rays, and follow-up visits. As necessary, the Nurse Case Manager will guide the patient to one of 19 off site offices where free specialty care is provided. Support. The medical clinic has 7 exam rooms complete with medical equipment. We have 36 volunteer physicians and 25 volunteer registered nurses. 17 volunteer interpreters and 25 volunteer medical office staff assist our medical professionals. Operations. The medical clinic is open to see patients 5 days a week, with several physicians and nurses on call per shift. Clinic doctors prescribe low cost generic medications as needed. We assist our patients in acquiring free non-generic medications from the patient assistance programs of pharmaceutical companies.